I seriously feel like laundry is the bane of my existence! Who’s with me?!? Sometimes I wonder why in the world I don’t have it all figured out by now. I mean, I’m going on 20ish years of doing laundry. I swear with each passing year, it gets harder and harder to keep on top of it! And just when I think I have it, I have days like today when I feel like the pile keeps growing and growing. It’s pretty bad when your six year old says that he absolutely cannot take another shower because there are no towels left in his bathroom. As I was doing laundry today, I realized that I was out of my favorite homemade laundry detergent. So, since I had to make a batch anyway, I thought it would be fun to share it with you! I know there are about a gazillion recipes for laundry detergent on Pinterest. And I’m not going to lie, I was super skeptical for a long time! I am kind of a detergent snob and I only use stuff that actually cleans my clothes. When we were first married, we bought one of those huge yellow tubs of cheap detergent because we were poor and just starting out. I hated it. HATED! I ended up throwing the whole thing out and swearing it off for good. There are just some things that are worth spending a higher price for, and in my opinion, laundry detergent is one of them. It wasn’t until I went to a ladies activity at my church a couple of years ago that I started to change my opinion about homemade detergent. The activity was all about cleaning tips and one of the ladies shared her recipe for homemade laundry detergent. She said she had tried all the recipes across the internet and this one worked the best. Plus, she said she had an HE washer and I always wondered how homemade detergent would affect my HE washer. In order for me to be sold, I decided that it not only had to cost less, but work just as well, if not better, than the more expensive detergent I was used to buying. In order for me to jump ship to the homemade bandwagon, the detergent had to smell good (and leave my clothes smelling good), it had to get stains out, and I had to feel like it was actually cleaning my clothes! This is Max and Logan last August wearing brand new school clothes. They decided that since I didn’t plant a garden, they would build a mud volcano in it instead. They were crazy muddy so I made them hose each other off, which, in hindsight I don’t think it taught them a very good lesson because they couldn’t keep themselves from laughing the whole time. But seriously, brand. new. school. clothes. UGH! As much as a tiny bit of laundry detergent might work for some people, that just wasn’t cutting it at our house. The more I started looking closely at the recipe, I decided that the reason WHY that is the case is that most of the ingredients that go into the recipe are laundry boosters, and not actually soap at all. As I was washing clothes one day, I was thinking about how each ingredient and realized that if I were to use each of these boosters separately, I would use a full amount of detergent and add a full amount of each booster to the load as well. So, how could only a tiny bit actually clean my clothes? The first thing that I tweaked in the recipe was the amount I was using. I’ll explain in a bit how I measure the amount I use. Just adding more alone made a HUGE difference in how well the detergent worked. Okay…so on to the recipe. I’ll explain a few of the other tweaks as I go. For all of the ingredients, it seriously costs me less that $20 and the detergent last forever. I do 6-7 loads of laundry per week and it still lasts me almost 6 months. It’s a fraction of what I used to spend on detergent and I really do think the quality is pretty great! Let me talk about the BIZ for a second. You can totally use OxyClean if you are a big believer in that. But I will tell you that I have seen serious laundry miracles worked with BIZ that I haven’t seen with OxyClean. (This isn’t sponsored or anything, just really what I love.) My mother-in-law introduced me 12 years ago right before Bria was born and I haven’t looked back since. And it’s almost half the price of OxyClean. You can find it in the detergent aisle as well. Alright…let’s get making this detergent! I have a huge bucket that I keep tucked away in my laundry room to hold all of the detergent. When I’m ready to make a batch, I just mix it all right in the bucket. I always start with the powdered ingredients. I’ve also found that I get a more consistent detergent if I mix after each ingredient. And the easiest way to do that is to just dig right in! You can wear gloves if you want. Or use a spoon. Or something to stir it with. But seriously, it’s not that big of a deal to mix it all by hand. The thing I love about adding in the Purex Crystals is that I can really start to see how well everything is evenly mixed. Here’s a quick tip. Be sure to save the little plastic lid that comes on that. THAT is how I measure the detergent. I roughly fill the cap up and then dump it in with my load. The last thing I add is the Zote Soap. You don’t have to use Zote, you can use Fels-Naptha if you want. They are both the same price and I’ve used both with good results. You could even mix the two together! Zote is really soft and grates easily. Fels-Naptha is really hard and grates more finely, so I think that there is benefit either way. I will tell you, though, if I use Zote, I put the detergent directly inside of my HE washer drum instead of putting it in the dispenser. My washer has a little filter that the detergent runs through and I noticed that the Zote grates were getting caught. But honestly, I really believe that the detergent works better when I put in directly in the washer drum. I’ve been doing it for over a year and I haven’t had any problems with my washer whatsoever! Before you add the soap, you have to grate it. I just use my cheese grater. If you are super lazy like I sometimes get, you can buy pre-grated zote soap. It costs twice as much ($2 instead of $1), but it might be worth it to you. Each box you buy is equivalent to 1 bar of soap. But it really is pretty easy to grate. I timed myself just to see and it only took 2 minutes per bar. Plus it’s good exercise for your arms. ;) I generally mix in each bar of soap separately – it really is easier to mix when you don’t have a huge pile of grated soap sitting on top. Some recipes around will tell you to use one or two bars of soap in a recipe this size. But this is the ingredient that actually cleans your clothes and I really does make a difference if you use more. And it still really works out to stretch quite a ways if you think that you’re using 4 bars of soap to clean hundreds and hundreds of pieces of clothing over a 6 month period of time. If you think about how much more soap you would use if you actually hand washed each piece of clothing with a bar. It certainly won’t last through hundreds and hundreds of clothes like it does in this detergent recipe. In my opinion, it’s still a really great deal! Once everything is all mixed, I put some of it in a pretty glass cookie jar and keep that on top of my washer. I put the bucket away in a cupboard and just refill my pretty jar as I need to. And that’s it! 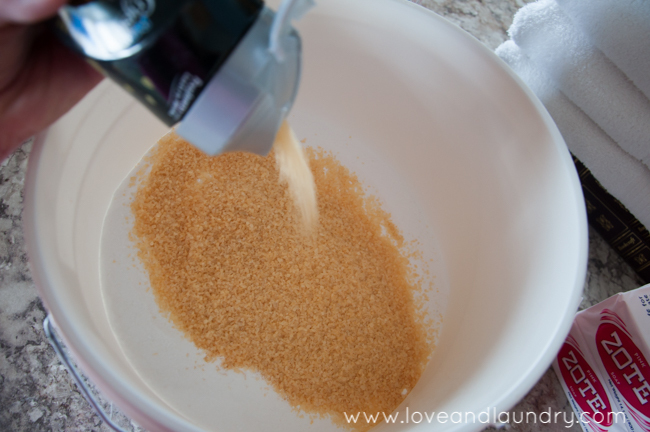 I really hope you love this detergent recipe as much as I do! It really has been such a laundry game changer for me. Feel free to ask any questions in the comments and I’ll answer them for you. I went to Lowes and bought one…thanks for the suggestion. Works perfectly for storing this detergent! Can you use gain instead of crystals brand? Yes!!! Definitely! I actually used Gain in the last batch I made, and I like it a lot better! What is Purex Crystals? Not in list of ingredients. Is it another detergent? Used in place of one of the others? Purex crystals just add a scent to your laundry. You can find it in a bottle by the fabric softener in the store. There are other brands as well in different scents. Purex crystals are a scent booster to make it smell good. I too have made my second batch my Husband takes it ti oil rig for hid very dirty work clothes. I found that layering the ingredients makes it easier to mix and if you use zote let it all sit overnight for easier stirring. Zote is softer when first grated. Are the crystals just for scent? If I don’t want added fragrance, could I just leave them out? You can leave the crystals out, it’s just for scent. What did you replace with the gain? I got a cheese grater at an estate sale for a couple dollars (electric). 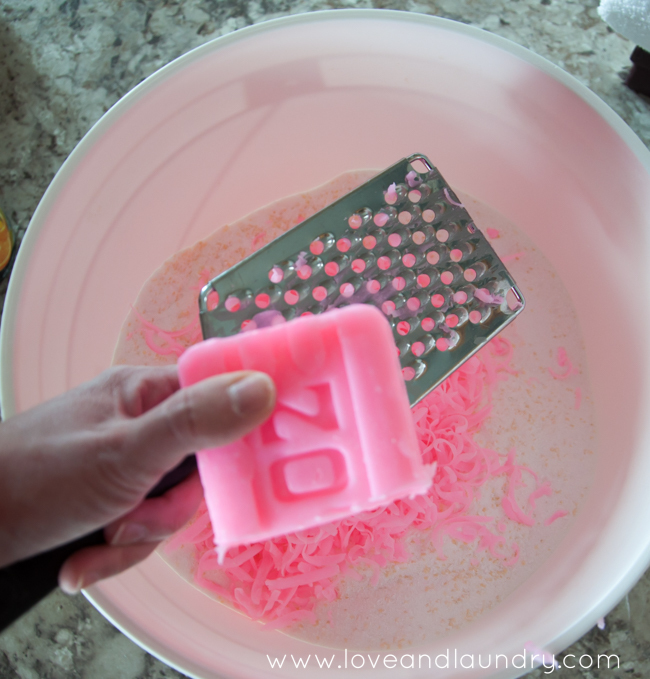 I use it only for grating the soap – it is fast and easy. I would not go back to hand grating, because it was always hard for me to do such a large batch (I always doubled the recipe, so I made a full years worth, once a year). Wow! That’s one good reason for having a cat. Good idea. I hate to spend money on buckets too. I need to find someone with a cat. You’re right! lol I bought one of the buckets because I wasn’t using the Tidy Cat litter at the time, but they work perfectly too! Is it okay to use in an he washer? I used your recipe and love it about to make my second batch! Can let me know how much i should be using per load? Did you say above that entire yellow cap? I think I was using much less. I’m so glad you love this as much as I do! Yes. I use an entire cap. I have an extra-large capacity washer and I didn’t feel like it got my clothes clean when I used less. But, if you have a smaller washer or wash smaller loads, then for sure use less. Maybe experiment with a few loads and see how little you can get away with and still come out with a clean load. I have a friend who only uses one tablespoon per load. I’m making my 2nd batch this weekend and we LOVE it. We definitely use much less than the capful. Maybe 1-2 tablespoons. When I use too much, I notice it doesn’t rinse as well, but that might just be my washer, also. I purchased all ingredients at Wal-Mart. Used flakes instead of bars of soap. Put flakes in food processor and processed into powder. Layered ingredients and mixed with long handled mixing spoon. Did not use crystals as I did not want a fragrance. Use white vinegar in rinse cycle and clothes smell fresh. Have extra large HE machine and put powder in bottom before adding clothes. Use 1/4 Cup for full load. Less for smaller loads. Putting flakes in a food processor sounds like an excellent idea. Had not thought about processing the flakes down smaller I too have a HE machine Thanks for the tip. I microwave the zote or fels soap and it crumbles to a fine powder. Looks like a cloud when done. 3 to 4 mins cut up in squares on glass plate. Putting the bars of soap(cut up) in the microwave, does that dry them out? Is that why they crumble?? Is that a 60 oz box of Biz? Thank you! I haven’t been able to find some of these ingredients at local stores, and online has many different sizes. Wow! That’s surprising to me! But good to know. I’m glad you’ve been able to find them online! I have allergies to everything I can’t use scented laundry detergent I have to get the kind with no dyes or scents in it. How can I be sure that I’m getting enough soap in each load and not just the boosters? Because the booster/soap ratio is very low on soap and each scoop obviously won’t have the same amount of soap shreds each tme? How much of the oap shreds are really needed per load to to make To make sure its getting my clothes clean? I don’t think it matters if there is an exact amount of soap. Even if one load has slightly more or less than another. I’ve just used the scoop from the Purex Crystals bottle for a few years and my clothes always come out super clean. If you give it a try, let me know what you think! I use the scoop from the Purex Crystals too. That was a good idea! Thanks! So far, I really like this detergent! I’ve wondered the same thing myself about not having a lot of soap compared to everything else in there. I’ve been putting two of the Pyrex lid fulls in each load mostly for this reason, but also because I don’t feel like the laundry has a pleasant smell unless I add more. When I put just one, I feel there is really no smell. You can also just add more crystals to your detergent. It’ll boost the scent without overusing the detergent. 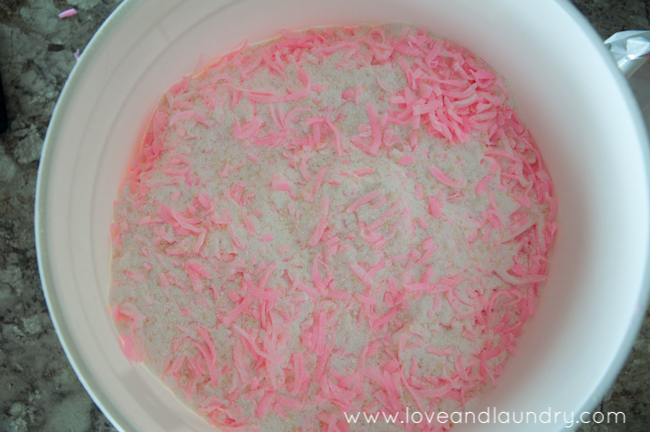 That’s what I did to get a little more scent to the detergent…added a little more crystals. This stuff smells great when it’s powder, but when the clothes come out of the dryer there’s no scent at all. I put 3 bottles of purex in and my laundry room smells great. My clothes, not so much. That stuff is not cheap. If I have to put 4 in to be able to get my clothes to snell clean, I may as well buy tide. Anyone have any suggestions? You should go to the Dollar Tree where you can purchase more scent booster for the same purchase as you would for a couple at Wal-Mart. I use the lid from the Pyrex crystals as a guide. I would say it’s roughly 3-4 tablespoons. I generally put the soap directly in the drum of my HE washer and I try to remember to put it in before I load the clothes. Also, a good trick to getting oil out of clothes (even clothes that have been through the wash and still have oil) is the blue Dawn dish detergent. I just squirt a little bit on the oil and it comes right out in the wash. I see it’s OK for HE, but is it OK for a front loader? Have Samsung front loader. You can also add a few drops of your favourite essential oil, that’s how I’ve always done it, as my husband’s skin is super sensitive! I suggest if you like a better smell to the laundry, make your your own fabric softener and use 1/2 softener and 1/2 water and put in a container , add small sponges and add 1 or 2 of the sponges to the dryer. 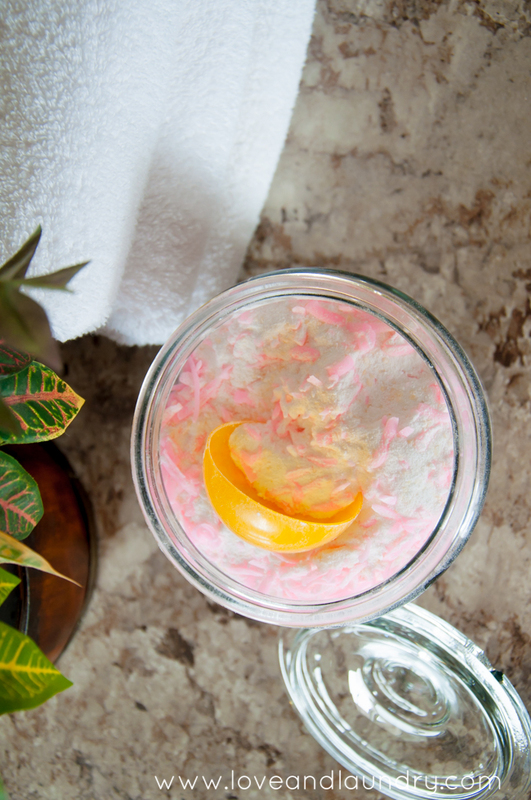 Squeeze out most of the liquid and your clothes will come out softer and smell great. You can find that DIY recipe here on Pinterest under Homemade dryer sheets. I wanted to ask the same. My zote is not dissolving and is sticking to dark clothes and pants. Wondering if zote flakes might work better. Anyone else have this issue? Anyone have better results using flakes instead? Do you know if this formula is safe to use on infant clothing? Personally, yes. I would feel safe using it on infant clothing. But, I also feel like it’s a personal judgement call…so it’s really up to you! Do you wash in Cold or hot water? I have found Zote in 7oz. or 14.1 oz. which one do you use? I use the 14.1 oz. Wow! I had no idea it came in smaller sizes! All of the stores near me only carry one size. Thank you for asking so that I can clarify! If using this in my he do I put it directly in with the clothes or in the washer dispenser? So, I’ve actually done it both ways. I normally put it right in the drum of my HE washer. And I put it in first – even before my clothes. The reason I started doing it this way is because I found that in my washer the grated Zote soap got stuck in the trap in my soap dispenser and wasn’t even making it through to was my clothes. For a while, I actually grated my soap, let it dry out and finally ran it through my blender so it would be more like a powder and not get stuck. I felt like that was way too much work! So, I tried putting it directly in the drum and I’ve been really happy doing it that way. That being said, if you really want to use the dispenser, I recommend swapping the Zote soap out and replacing it with Fels-naphtha soap because that soap is harder and it grates pretty finely, so you shouldn’t run into the same problem. Hope that helps!! I was wondering the same thing…just use a regular fabric softener? Or do you even need one? Recently, I started using white vinegar in my fabric softener dispenser and it made a huge difference! The clothes come out so soft…no vinegar smell either. Just really clean and nice! Do you have a top or front load HE washer? This recipe is safe for he washers? Yes it is safe. But, I do add the detergent to the tub instead of dispenser. I have a family of 8 so as you can imagine I do a TON of laundry! I made this soap about two weeks ago and I think it cleans great…BUT… Every time I take my clothes out of the wash there is a gridy/kinda soapy resedue that sticks to some of my clothes and the bottom on my washer. It will dissolve into a powder and release from the clothing in my dryer but I’ve noticed the ring of my dryer getting gridy with the powder (in places I can’t clean out). I also don’t like to dry any of my or my husband’s shirts so it’s kinda impossible for me to use this detergent with those shirts because when I hang dry them the residue just dries on them and they end up looking like white deodorant was rubbed all over the shirts. I still have a HUGE container full of this detergent and would really like to use it so if you have any recommendations they would be greatly appreciated! Wow! I’m sorry to hear that! I definitely haven’t had that problem at all. I would recommend cutting back on the amount you use. Do you have hard or soft water? I’m wondering if the water you use may be contributing to the reside. Also, you could run an extra rinse cycle. That may help as well. I put mine in the tub and start the water first to start the dissolving process. never have a problem doing it that way, this dissolves quickly. going to try Biz this time instead of oxi-clean too. I was experiencing the same thing, so I put powder in first and using the warm cycle for just a few, it seems to help it dissolve faster. Again you don’t need a whole ton of the warm H20, I’m a big believer in the cold water cycle works just fine! And the most detergent I’ve ever had 5o use is 1.5 TBSP, and that’s on super soiled garments. Rather than Biz, or Oxy I use a couple bars of Castile soap. Don’t give up, just mess with it a bit and it’ll be so worth it! I haven’t had that problem. I put the detergent in first before the clothes and really find that helps to dissolve the detergent. Thank you soooo much! I just finished making this.. My total came to about $40 but that included the bucket, lid and grater as well. Plus the oxi clean is enough for two batches!! This is still going to save me a lot of dough!! By the way it smells AMAZING….. Literally my laundry room is wafting delicious smells into the rest of my house!!! Oh and it took me less than 20 mins to make this and I grated my own soap as well!! I was wondering if it did smell good! Im trying to save money & want to try this but if my clothes dont smell good then i wont bother.. I find this detergent has a clean smell to it. The crystals really help and I do use fabric softener as well. I wish I had bought the Gain crystals…that usually smells great! How many loads does this recipe make? Hi! I love this recipe, but I think I will use an airtight container so it doesn’t get hard. What size jar are you using for yours? Does it fade dark clothes easy? That’s what I want to know, because oxyclean fades darks pretty easily. I used the Biz instead of the Oxyclean. Really like it and doesn’t fade my clothes! Think I’m going to try this one! Do you find the Biz really makes a difference? I had thought by adding that, you wouldn’t need the Zote soap. Also, has it affected your water pipes at all? I guess I worry about build up in the lines. I guess by adding to the drum before the clothes helps it to desolve better. Thanks for sharing your recipe! It cost me $29 for the ingredients. This is my 2nd time making. I bought the first recipe of ingredients about 5 months ago and still have about a Gallon left. Is there anywhere you guys have found the ingredients cheaper? I READ ON PINTEREST THAT YOU CAN CUT THE BARS OF ZOTE AND PLACE IN THE MICROWAVE. 30 SECONDS AT A TIME UNTIL IT HAS EXPANDED AND BLOWN UP. THIS IS EXTREMELY HOT AND WILL BURN YOU!!!!!!!!!!!!!!!!!!!!!!!!!!!! LET IT COOL OFF FOR ABOUT HALF HOUR OR MORE. WHEN COOL TAKE IT IN YOUR HAND AND JUST GRIND IT BETWEEN YOUR PALMS AND IT WILL BREAK UP LIKE SAND. SAVE ALOT OF TIME WITH NO DIRTY GRATER. AGAIN, BE VERY CAREFUL WHEN TAKING IT OUT OF THE MICROWAVE!!!!!!!!!!!!!!!!!!!! When I recently made this, I found Zote flakes in a box. Was so much easier! Walmart sells it. I’ve been wanting to try a homemade laundry detergent, but I skeptical about how clean it will actually get my clothes(I’m a Tide girl). And I also worry about fading, because some detergents tend to fade clothes pretty fast. Have you noticed increased fading, and do you feel it gets your clothes just as clean as the expensive detergents? 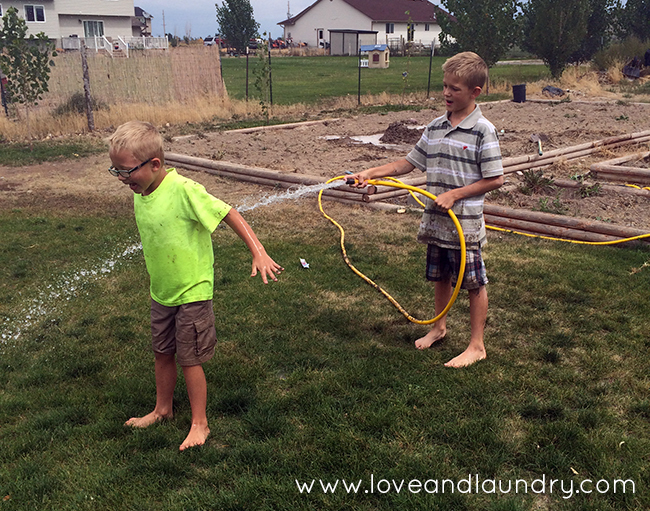 I’ve been buying laundry soap and fabric softener that’s for sensitive skin – free of dyes and perfumes – for almost two years due to my sons skin allergies. Do you think this soap would be safe? His allergies aren’t too bad… But I would hate for them to come back. I was wondering if i could use ivory soap instead. The laundry soap i make now i use ivory soap in it. My husband and daughter have very sensitive skin. Thats why i make mine with ivory soap because i know they can use that soap. for large load Maybe the girl who had flake residue in her clothes is using way too much. I made a batch in the middle of May and still have ¾ of a gallon left. I wash at least 3 loads a day, sometimes more. Oops, please excuse the lack of proofreading. I just bought all the stuff to make this, I am beyond excited, been wanting to make this for more than a year. I recently made this too and love it! I did find the Zote flakes at Walmart. So much easier than grating! I only wish I had bought the Gain crystals…the Purex is ok, but not great. I use the medium container of Gain scent crystals. They provide a great fragrance. I use the zote, I use my cheese grater and then put it in my food processor with some baking soda so it gets really small, it keeps it from gumming up the works in your washer! Is this recipe safe for darks ? My hubby wears slacks & dress shirts for work & my main concern is his delicates. I’ve heard good things about Biz & really wanna try this out. How much should you use if you don’t have an HE washer? Can you use bleach with this detergent? I recycle fabrics from old clothes and sometimes need to use bleach. Where do you purchase all your ingredients? I’ve found them all but I can’t seem to get them all under $20 like you said you can do. I bought my stuff at Walmart. I thought the price really wasn’t too bad considering it made such a huge batch. This will last a long time since you just use the small capful. Does this detergent take the stink out if workout clothes? Does it work in cold water wadges? Thx! I find it makes your clothes smell clean. 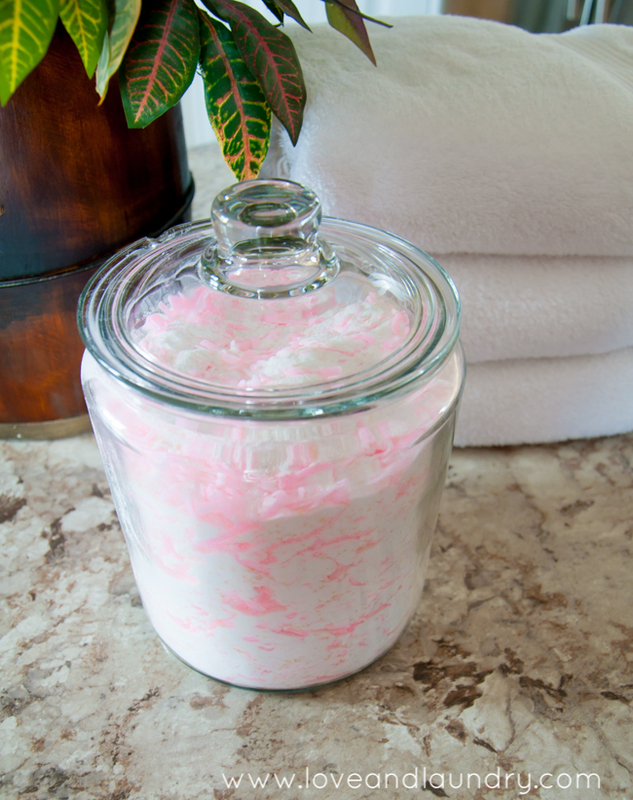 I recently started using white vinegar in my fabric softener dispenser…what a difference! My clothes and towels come out so soft and smell so good! No vinegar smell…just clean! I’ve been using a recipe similar to yours for 6 months or so in our HE washer. It works great on all of our clothes from a busy toddler to 2 teenagers to my husband’s grimey work clothes to my nice dress clothes!!!! The only things I do differently….. I grate my Zote onto 2 large cookie sheets and let sit for a day. It makes the soap nice and crumbly. I run it through my food processor then add to the bucket with other ingredients. I also use Arm & Hammer baking soda crystals instead of Purex. We haven’t had any issues with residue on clothing or in the washer! 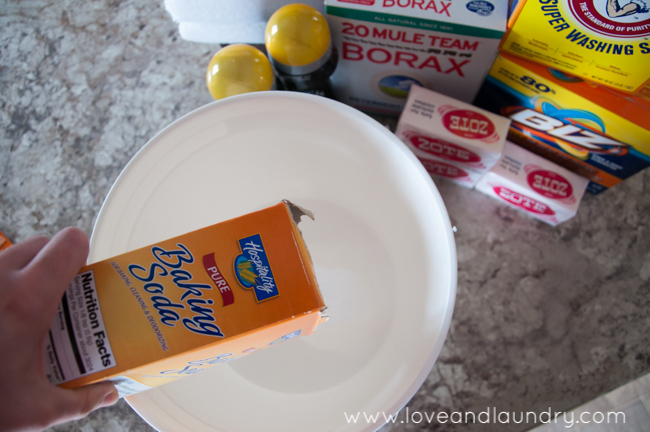 My husband is allergic to Borax. Any suggestions on substitutes or do you think it would work ok leaving it out? Where can I purchase the glass jar?! Can someone tell me if you can use this in a top loading washer. If so how much do you use. Curious if anyone has used this with sensitive skin? I have two kids with eczema. Made this soap about a week ago. I’ve used Zote soap by itself for delicates (cold water) for years. My family has very sensitive skin and I have to be very careful about what soap I buy. This recipe for laundry soap is working GREAT for us. We have horrible hard water! Nobody drinks tap water around here! But, this soap is cleaning our clothes. And making them soft, soft, soft! Even older towels that had gotten a little hard over the years are soft after one wash! I use only one measured tablespoon for each and every load. (Hot and cold water) Stains are coming out! White’s are very white, and darks are staying dark! I don’t get it, but why question what works? I have lived with this hard water for 31 years and this is the best and least expensive (in A BIG WAY!!) soap I’ve ever used!! We put all ingredients into a new bucket from home depot, put the lid on nice and tight and our granddaughter had so much fun rolling it all around! Then we filled a decorative clear container (similar to picture with recipe) with the mix. Leaving the rest in the closed up bucket. I guess I’ll let you know in 6 months or so how many loads it makes. Yes, I’m keeping track!! Inquiry minds want to know, so I’m going to let them know!! Oh, one more thing. I believe if you are getting residue on your washed clothing, you might be using too much mix. Try keeping it down to a measured tablespoon and see what happens. It does not suds up a lot, but that does not mean it is not cleaning well. I love this detergent also! Got one of those big buckets too. 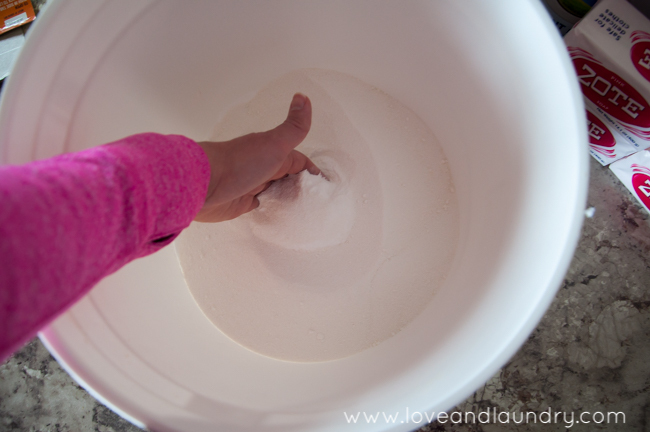 Recently, I started using white vinegar in my fabric softener holder….wow! My clothes are so soft and smell so clean now. No vinegar smell…just clean! Wish I had tried this a long time ago! You probably don’t even need to use the Purex crystals. That’s added to give it a nice smell. The detergent smells clean without it. I’m not sure, but I thought I saw another brand that was for sensitive skin? Maybe check at your local store to see what kind they have. Thanks ladies!! I’m excited to try this. I don’t use them and the detergent works great without it. I hate to be that person but I was curious if this is chemical free? I wasn’t sure with the zotes and laundry crystals. How much white vinegar do you add to the fabric softener dispenser? Does it need to be diluted at all? Hi. I would love to try this but i have no idea what zote soap is. It’s a bar soap that you can find in e laundry section…been around for many years. Fels Naptha is another one. They make Zote soap flakes now in the box which is what I used to make this detergent. It saved me from grating the bar of soap. It’s a bar soap that you can find in the laundry section…been around for many years. Fels Naptha is another one. They make Zote soap flakes now in the box which is what I used to make this detergent. It saved me from grating the bar of soap. Is it ok to use bleach as well when needed? You can let the grated soap sit on top of the powder mix for a few days until it dries out a bit. I scoop it out with a larger holed strainer and put it in my blender with a small amount of the powder mix which turns the greater soap into a powder and then it can go right into my soap dispenser of my HE washer. I also like to use scented castile soaps (I get them at Meijer and they do cost a bit more but worth it) or Kirk’s castile soap. Thanks. Mine’s not wanting to dissolve all the way. I read the microwave idea but I’m accident prone and this sounds safer. No…it’s not all the way full. I keep a cup in there to refill my pretty glass jar. Is there a liquid version of this recipe?? We have a septic tank and can’t use powdered detergent!! In the laundry room I have kept a small glass mayo jar. I add my powdered detergent and some water, shake well, then dump it int the washer. Presto…..liquid detergent. Save on buying the buckets. Go to a local grocery store that has a bakery and ask if they can save you a 5 gallon bucket with lid. most stores throw away. I also was wondering if there is a liquid version of this. I used to make my own liquid detergent using the common recipe many people use. I want to try this one but I prefer liqhid. I made my first batch today using zote and fels soap since I had both on hand. I save my plastic coffee cans which came in handy today for my detergent. This is the first dry mixture I made. I have been making the no grate liquid detergent with dawn soap but I wanted to try the dry formula. Both smell great and cloths are clean. I use the Pyrex crystal since I had a coupon and one bottle was free. My ingredients all came from Walmart which I purchased in Nov for less than $20. Just made my second batch. I use my foldger coffee tubs to store my detergent in it takes 4 of them. I used the Gains Crystals this time and the pre-grated zote soap. So far I feel it saves a lot of dollars in the long run plus it does a great cleaning job. I also use the homemade bleaching recipe. I assume this can be made without the scent crystals? Scented products always make me sneeze! Thanks in advance! Sure you can! The Purex crytstals are only added if you want a scent to the detergent. It will still have a clean smell without it too. You only use 1 tablespoon in a large load of laundry?!?! I am blown away!!! I have sensitive skin and problems with eczema. I have been using the honest company’s detergent, but obviously it’s expensive. If I were to use your recipe, would I just omit the smelly crystals to keep it fragrance free? I want to make sure I’m not missing anything smelly(ie irritating to my skin) when I make my first batch. It is hard not having my detergent smell( I love smelly stuff), but all it does is irritate my skin. I think leaving out the crystals would be fine. The detergent smells clean on its own. I also use white vinegar for my fabric softener…works great to soften clothes and no vinegar smell either. Just fresh & clean! Thank you! Do you put the vinegar in fabric softener compartment when you wash a load? How much do you use? Yep…I just fill the compartment with the white vinegar. It leaves my washer much cleaner too! Cuts the soap buildup as well. Hope you like the detergent…it makes a bucket full and you only use a few tablespoons. Thanks so much for this really easy, awesome recipe! I placed a link to your page from my blog because I loved it so much! My clothes are so much cleaner! I’m so glad I found this on Pinterest! I use 2 boxes of the easy dissolve zote flakes. They have them at our local walmart. Hello!! I found this powder recipe and I am so excited to try it out!!! The family homestead has a similar recipe but it’s for liquid detergent. After making(which is a hassle on the stove) it needs to cool and sit overnight till it forms an egg drop soup kind of look to it, but it is always impossible to get it to the laundry room for me because of the weight of it. As soon as I saw u add Biz and more zote I was SOLD! I swear by biz and with a toddler and two boys I can’t afford pricey stain removers. I can’t wait to try this. Thanks for sharing this with everyone!!! The Zote flakes that are sold say on the package “NO NOT USE IN HE MACHINES”, so I stuck with the cheaper bar and grated myself. Really? I didn’t know that…I used the flakes. I just put the detergent in the tub first before the clothes and it works fine. I read another post that the soap flakes don’t work well in the dispense for HE machines. Keep us posted how yours works. I may use the regular Zote soap next time. Thanks! I have a front loader and was wondering if I should put the powder inside the load or in the dispenser ? I read that as well, so I put mine in the tub first before the clothes. It seems to work well that way. I have used the zote flakes without any problems with my he front load machine. I usually wash my darks in cold water. I don’t find this detergent fades them. Pinterest Success! I purchased all of the items using Biz at my local Walmart for $23.50. I used only 1 Purex Crystals as my hubby is not too fond of scents. I splurged and bought a large 5 quart glass container to set on my laundry table for this mixure. It all fit perfectly. I love the fact that all of these items (except the purex crystals) came in cardboard containers. I was able to recycle all the containers and this works amazing! We have hard water so using the Biz is a better fit for our water and the clothes come out clean and smell great. I estimate that this large container will last the 3 adults in my household for over a year! I have an HE washer and I have always used Tide as it just WORKS but so does this stuff. Thank you so much for the recipe (oh and the grating of the soap was not difficult at all) Putting it all together took less than 10 minutes. Pinterest Success! Just curious…which soap did you use? The Zote? I know some people use the Fels-Naptha and was just wondering. Thanks! Such a great post. 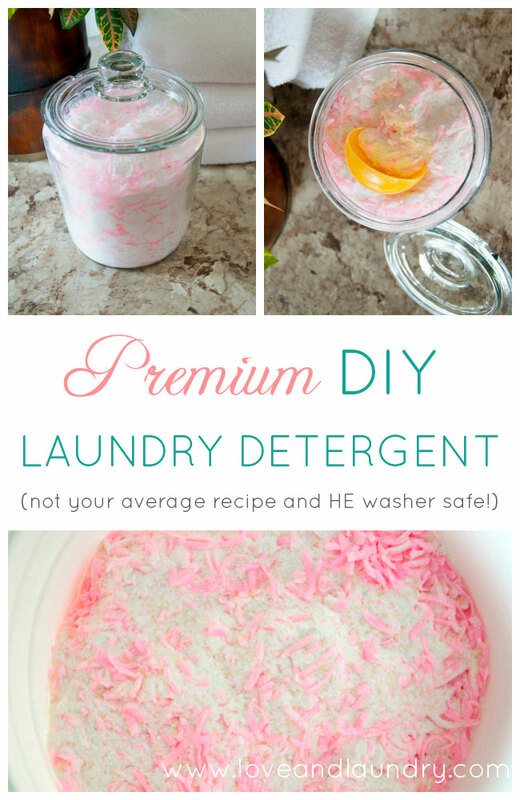 You shared an amazing cost effective and easy detergent recipe. I just wanted to ask that it will fade the color of clothes or not? I’ve read that some people use Ivory bar soap..do you have that kind there? I read another post that used Ivory soap. Do you have that in Canada? I’m sure there must be a substitute you can use. If I find out, I will post again. Good luck! I have an HE washer too. I just add this detergent to the tub first and then add clothes. Works great! My machine only uses HE is this HE safe? Just curious if you can actually use bleach with the Biz. I know the Biz is supposed to replace the oxyclean in this recipe, but the Oxyclean says do not use with bleach on the container. What’s the difference between Biz & Oxyclean & is it actually safe to use bleach with the Biz version? I made the recipe as directed but it isn’t going to last anywhere close to 6 months. I do love the way it cleans my clothes, though. How do you handle permanent press that say “use no fabric softener or dryer sheets? Thanks for the recipe! I was using a recipe with only borax, washing Soda and Dawn dish soap. I liked it, it cleaned well, but I started getting little oily spots on my clothes that weren’t there to start with…wondering if anyone has had any issues with this? I stopped using it and after like a month of store bought detergent, the oily spots stopped happening. I have been making my own soap for a few years now, but always with the other recipe that uses less soap. I will for sure be going to the store today to get more ingredients and using your recipe. My husband is a mechanic and it is exhausting trying to get his clothes clean. One tip I do is I use my food processor to get the soap as fine as I can, and mix everything up in a plastic trash bag (heavy duty made for yard waste) everything gets mixed well and then I add it to a bucket for storage. If you have a Sam’s Club nearby (perhaps other stores do this too) you can go to the bakery department and ask for a Icing bucket. They will give you two FREE per visit. Great for storing soap. I believe they are 5 gallons. Thank you for the recipe! Do you find that with this detergent that your grated soap ends up at the front of your drum (front loader) not desolved @ the end of the wash cycle?? If so, do you have a suggestion to fix this issue?? Some have suggesting grating the soap and then spreading it out for a day or two until it dries out. Then it will crumble into dust. Or in the laundry room I have kept a small glass mayo jar. I add my powdered detergent and some water, shake well, then dump it int the washer. Presto…..liquid detergent. in HE machines? Mine is a top loader. I have used the zote flakes in my HE machine (front loader) without any problems. Sorry to bust in on your post, but, I live in Australia, and haven’t a clue what a HE washer is. Can anyone tell me? Is this a dumb question? he washers use less water and are all you can buy in america now. Mine has a clear lid its amazing how much less water. Yes you are right its not smart to wash with less water people with the older water hungry washers better repair as long as possible. Using less water also means special detergents or the suds wont all come out. I plan to try your recipe for laundry soap. I currently use a slightly different recipe, but have always added either BIZ or OxyClean separately to each load. One other suggestion is that I use Soda Ash purchased at the local pool supply. A lot less expensive than Super Washing Soda and it is the identical ingredient (sodium carbonate). Hi Christina – I ordered my Zote from Amazon. Thanks for sharing this recipe! I’m excited to try it! Does the pink Zote soap ever cause any staining problems? Nope! Not at all! I use this recipe for years for everything I wash, including whites and I have never had a problem with staining/. Do you know about how many loads this batch lasts? Thanks for sharing! Can this be used in a front loading washer? 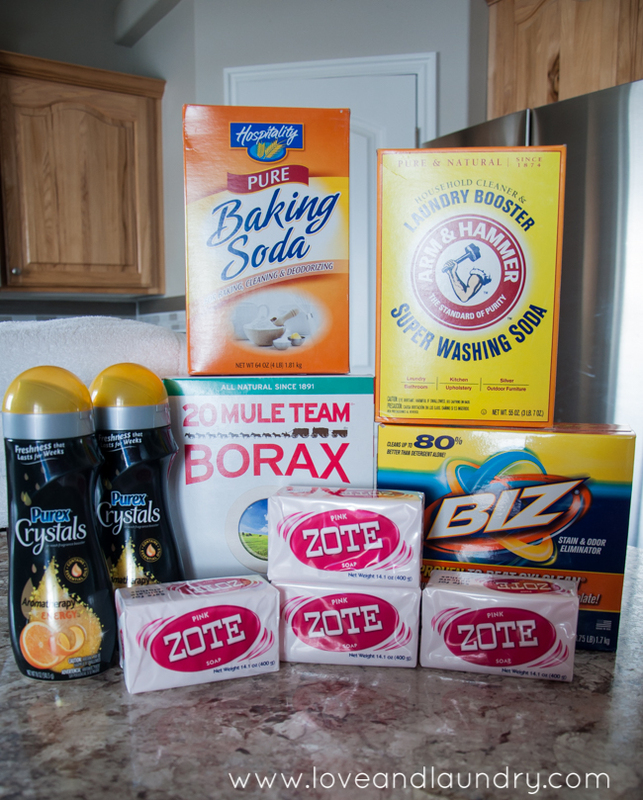 Why the need for both baking soda and washing soda? Do you need both? My husband is a mechanic and his clothes SMELL even after washing. Is this heavy duty enough for his clothes? 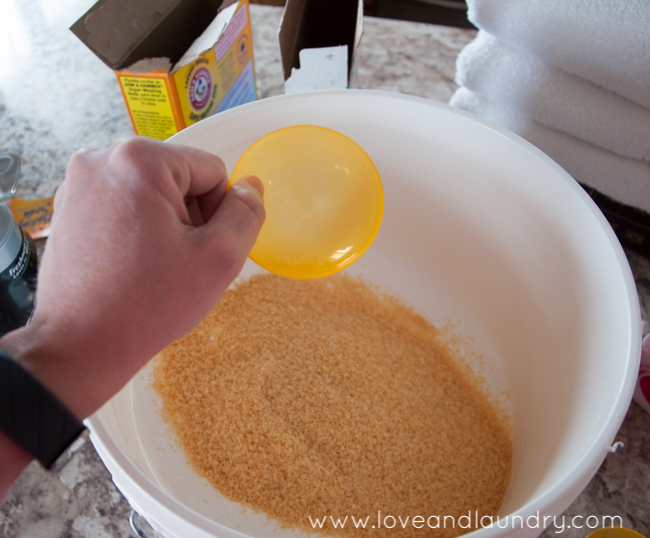 This is very innovative and excellent idea how to make laundry detergent very easy and simple way. Thank you very much for sharing these natural ingredients. To mix the ingredients more efficiently I bought a coffee grinder and ran the whole mix through it. My machine does not like to dissolve the grated soap very well so I did this. It works like a charm and your entire laundry mix is like fine powder. No dissolving issues here. I was wondering if you have made this in the liquid form? havent been able to find biz is the clorox badditive comparable? havent been able to find biz is the clorox additive comparable? I made this for the second time today. The first was ONE YEAR AGO and my family of 4 just ran out! We love it!! I have two teenage daughters who love to do laundry ‍♀️. We probably do 4-8 loads a week. I am amazed at how long this lasted and how well it has worked for us. Thank you for sharing your recipe!